All photos are Copyright (c) 2010 Rebecca Ann Sherry and may not be reproduced without written permission. Click here for the accompanying photo essay. 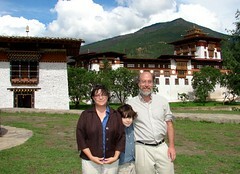 Michael Givel, Rebecca Sherry, and Noah Givel in Bhutan. Photo by Rebecca Ann Sherry. From late June 2009 to late December 2009, I was honored to serve as the first ever American Fulbright scholar in Bhutan, a small constitutional monarchy between India and People’s Republic of China. Accompanying me on my journey to this ancient, rugged, and beautiful eastern Himalayan nation was my wife Rebecca Sherry and 11 year old son Noah Givel. The U.S. Fulbright program was created to increase cultural and intellectual understanding between Americans and citizens from numerous participating countries. After an intensive two-day briefing on Bhutanese higher education and culture at the U.S. and Bhutanese embassies in Delhi, India, I flew on Bhutan’s DrukAir (which provides full course in-flight meals at no additional charge) into Paro International Airport. Paro has been called one of the most dangerous airports in the world. Planes must fly around two large mountains to land and can only land in the daylight. Despite these claims, I was entirely relaxed as the DrukAir pilots landed the aircraft smoothly with no problems, complete with soothing Bhutanese-style landing music. A large billboard of the five kings of Bhutan was the first sight to greet me at the international airport. Bhutan just recently became a constitutional monarchy that held its first parliamentary elections in 2007, and the people of Bhutan still revere their kings. During my tenure as a Scholar, I not only engaged in teaching, research, and consulting, but I was also the unofficial U.S. cultural ambassador to Bhutan. No one from the U.S. had ever served in Bhutan in this capacity prior to my arrival. In fact, the U.S. and Bhutan have no official diplomatic relations, and there is no U.S. Embassy or Consulate in Bhutan (although unofficially the relationship is warm). This made me temporarily the highest-ranking permanent U.S. public official in the country. My duties included meeting with high-level government officials and attending state functions. I interacted with numerous members of Bhutanese society in a variety of formal and informal capacities, ranging from attending national archery matches, which is the national sport of Bhutan, to sampling various Bhutanese dishes such as ema datsi—a delicacy made of cheese and chili peppers. I highly enjoyed the Bhutanese food, which almost always includes red rice and chilis. I discussed Bhutan’s primary public policy — Gross National Happiness — with Prime Minister Jigme Thinley. In 1972, the fourth king of Bhutan proclaimed that Gross National Happiness was a more important measure of progress than Gross Domestic Product (which is what is often used in the U.S.). GNH guides development to balance the four pillars of social progress: sustainable and equitable development, ecological protection, good governance, and cultural preservation. Bhutan has several diverse ecosystems ranging from subtropical in the south to high level, alpine, and frigid Himalayas in the north. Due to the sudden rise in elevation and wide geographical and climatic diversity, the World Wildlife Federation–Bhutan in 2009 described Bhutan as a “global biodiversity hotspot” being one of the “234 globally outstanding eco-regions of the world.” Bhutan has an amazing diversity of wildlife including Bengal Tigers, Asian elephants, snow leopards, blue sheep, yak, red pandas, and takins, which look something like a cross between a cow and a goat. While a large majority of the population is Buddhist, Bhutan also includes a sizable Hindu minority and a tiny Christian minority. In stark contrast to the U.S., the only houses of worship in Bhutan are Buddhist or Hindu temples. While in Bhutan, I learned a great deal about Mayahana Buddhism as I visited a number of these temples and monasteries. The Taksang (Tiger's Nest) Temple is a renowned Buddhist pilgrimage site in Bhutan. Photo by Rebecca Ann Sherry. Inside these ancient places of worship I often viewed Buddhist monks chanting amidst the smells of sweet incense and giant colorful statutes of the Lord Buddha and Guru Rinpoche, who brought Buddhism to pre-Bhutan in the eighth century. While I lived in central part of Bhutan’s capital, Thimphu, near the Danish Consulate and Bangladeshi Embassy, my scholarly activities took place at the scenic and mountainous campus of the Royal Institute of Management (RIM). The RIM is the only institution of higher learning that educates students to become lawyers and civil servants in Bhutan. The students were very serious scholars with a high aptitude and ability for learning at the graduate level. They all wore the uniforms of the country’s national dress, a robe-like gho for men and a long kira and short jacket-like tegu for women. They were extremely polite and even rose when I entered the classroom. This is very different manners and customs than what often occurs in U.S. college classrooms. High above the Royal Institute of Management, which I visited several times, is the ancient Thimphu Dzong. Dzongs are ancient fortresses scattered throughout the country that housed and still house Buddhist monks and secular administrative and political leadership. I first thought about conducting research in Bhutan due to a 2004 law that bolstered Bhutan’s tobacco smuggling policy and prohibited tobacco sales and smoking in public places, but still allowed personal consumption of cigarettes that were imported and carried in small amounts by individuals into Bhutan. I have written many scientific articles on tobacco control, with the most recent monograph published in November 2009 entitled: Tobacco Use Policymaking and Administration in Bhutan. This monograph was published a week before the Bhutanese parliament went back into session to debate an amendment to their 2004 national tobacco control law, which was enacted for religious and public health reasons. I sent a copy of the article to all members of the Bhutanese parliament (lower house) and National Council (upper house). The report, which was the subject of a prominent news story in one of Bhutan’s major newspapers, provided specific policy and administrative recommendations for furthering Bhutan’s anti-tobacco effort. These included adopting general anti-tobacco plans, coordinating public and private resources to counter tobacco use, and conducting scientific studies on the effectiveness of health education campaigns. Provisions in the amendment to the 2004 Bhutanese tobacco law were crafted independently of my report but echoed many of my recommendations. The new tobacco amendments were passed in December 2009. My experiences in Bhutan were eye-opening as I learned much about how Bhutanese Buddhist and Hindu culture operated. As a returned Fulbrighter, I am now sharing my experiences with American audiences in lectures on Gross National Happiness, the culture of Bhutan, and tobacco control in Bhutan. I am speaking to diverse U.S. groups ranging from elementary school children to academic audiences to audiences interested in Bhutanese folk life, arts, and culture. Michael Givel is an associate professor of political science at the University of Oklahoma and a member of the Voices of Oklahoma Board of Directors. Very interesting retelling of Professor Givel’s travel and work in Bhutan. I thoroughly enjoyed it. Dr. Givel’s lecture and slides about Bhutan’s policy and evaluation of the Gross National Happiness was an excellent introduction to Bhutan’s perspective on the duties and responsibilities for it’s people’s well being. I highly recommend it to anyone interested in how other cultures view the world. I’m from Bhutan and the editor of a monthly news magazine called Drukpa. We are publishing our fourth issue, the theme being ‘environment’. Thoroughly enjoyed your refreshing article and thought it’d make a lovely accompanying piece to the many other issues we’re covering related to the environment!